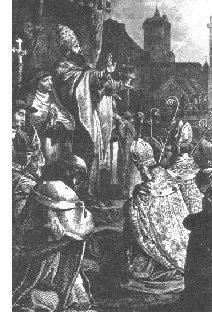 Pope Urban II (ca. 1042-1099) - Born Otho of Lagery (in Champagne, France), he is the figure most associated with initiating the Crusades. Pope Gregory VII (see Henry IV above for more on Gregory VII) appointed Otho archbisop of Ostia in 1080. As a close ally of Gregory's, he was likely tapped as a possible successor to the Pope (in fact, Victor III succeeded Gregory, but was Pope for only a year). When Otho was elected Pope in 1088, the transition was anything but smooth. He took the title Pope Urban II, but had to deal with the aftermath of Henry and Gregory's feud. Clement III was still Antipope and this prevented Urban from settling in Rome until 1094. Once in Rome, it would only be a year before he convened the Council of Clermont (see above). It was here that he delivered his infamous speech that motivated Catholic warriors throughout Europe to journey to the Holy Land and declare war on Islam. There are five accounts of the speech which were written down, all of them years after Urban gave it and varying greatly from one another. It's interesting to note that nowhere does there appear the famous phrase, "God wills it" in any of the accounts.